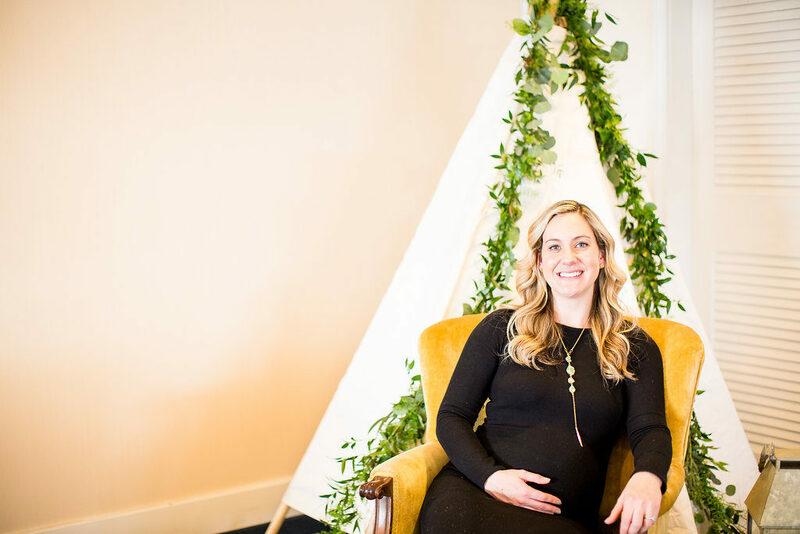 Having a baby, especially your first child, is such an exciting time for expectant parents, grandparents, family and friends. This was no exception for Meredith. Joined by friends, colleagues, and family from near and far. 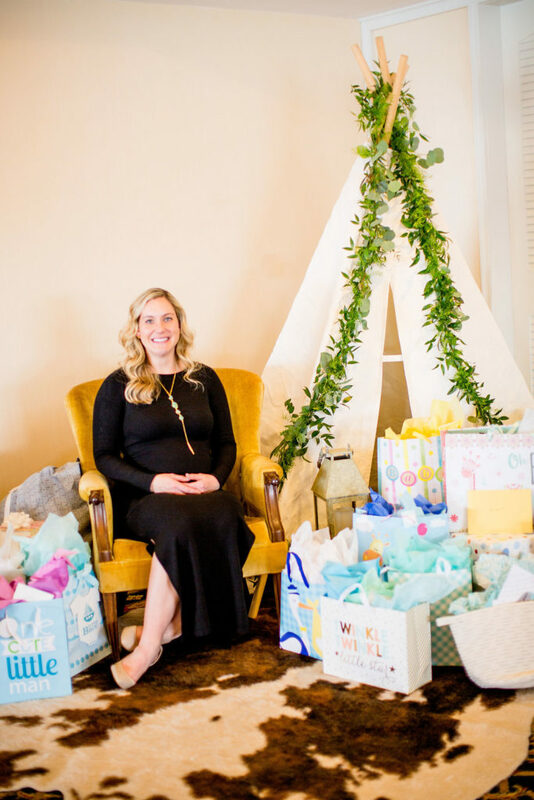 Surrounded with love, Meredith was showered with a bounty of gifts for Baby Carson. 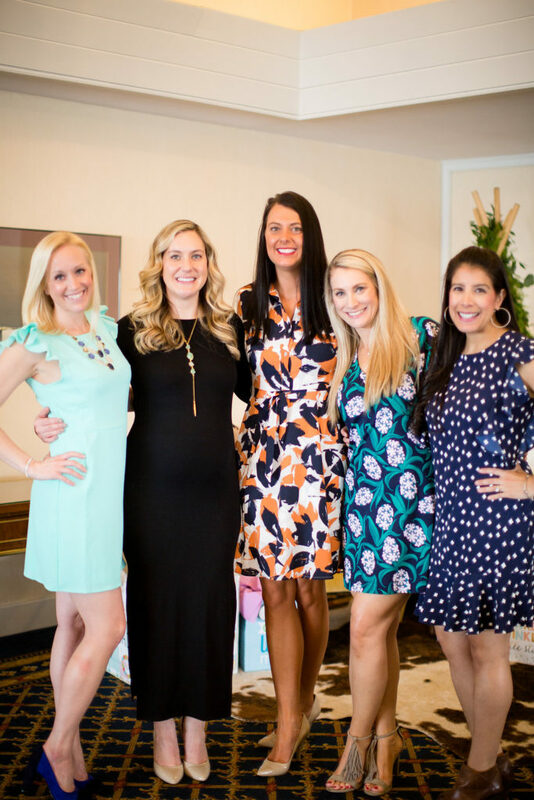 Taking our cues from inspiration images shared with us, we set the stage at Norfolk Yacht & Country Club to kick off their greatest adventure with a baby shower filled with natural elements and outdoorsy details for a special baby boy. Adventure themed baby shower dessert station. Yummy chocolate naked cake by Buttercream & Sprinkles. 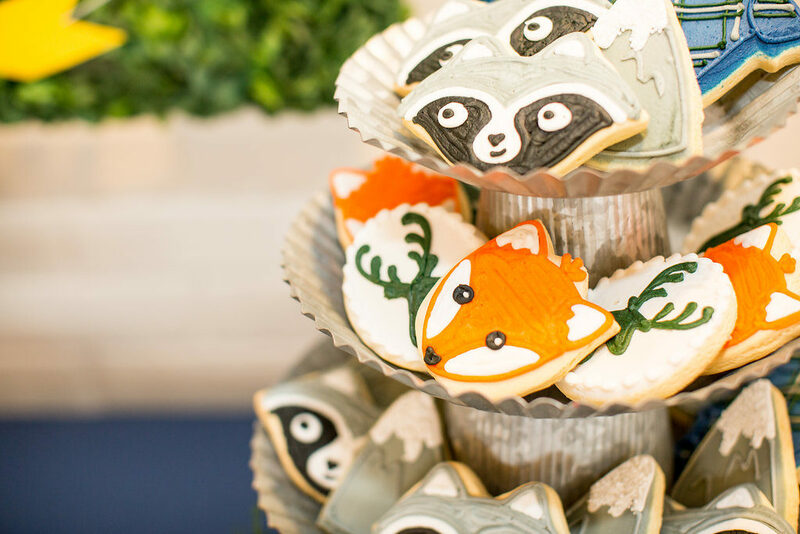 Forest friend iced cookies baked and decorated by Cookies by Design. 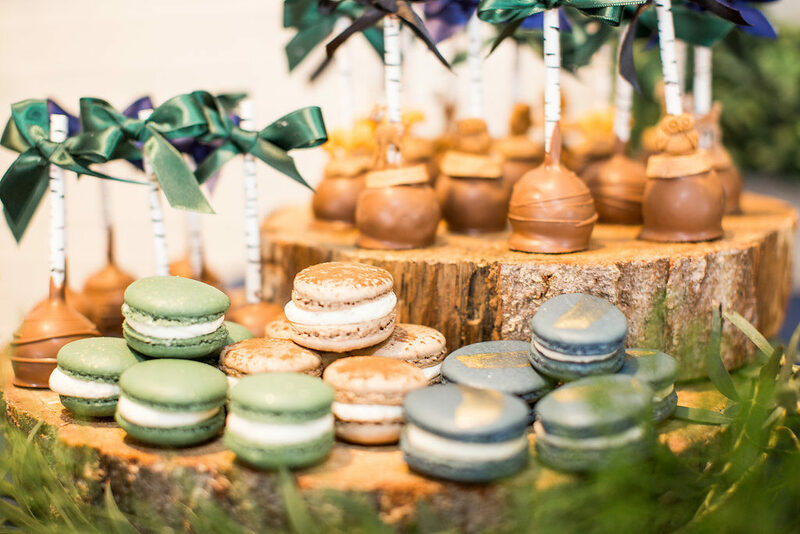 We love those birch straws and chocolate creatures on the cake pops! Treats made by Buttercream & Sprinkles. Known for our dessert stations, this mom-to-be asked for one filled all her favorite treats. 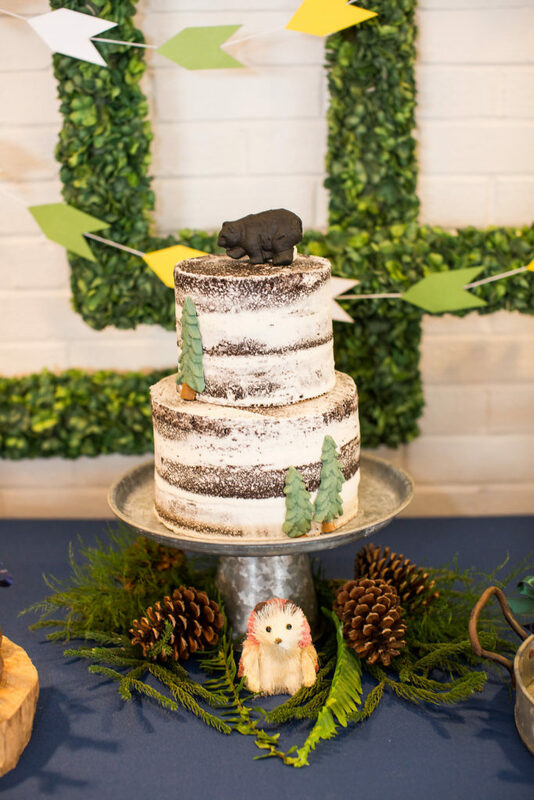 Taking center stage was an chocolate naked cake adorned with candy evergreens and topped with a black bear. 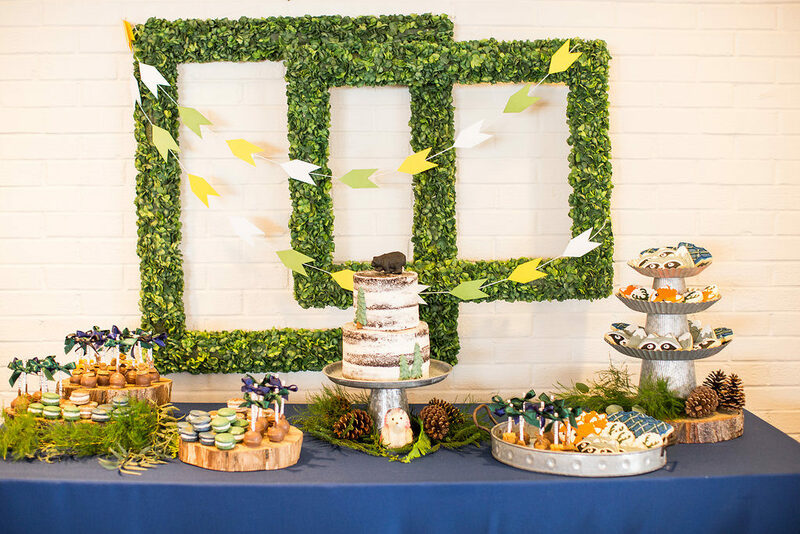 Wood slabs covered in macarons and cake pops as well as tiers of cookies iced with images of forest friends like a deer, fox, raccoon not to mention snow capped mountains and the most adorable plaid onesie to match the table linens. No detail was overlooked. 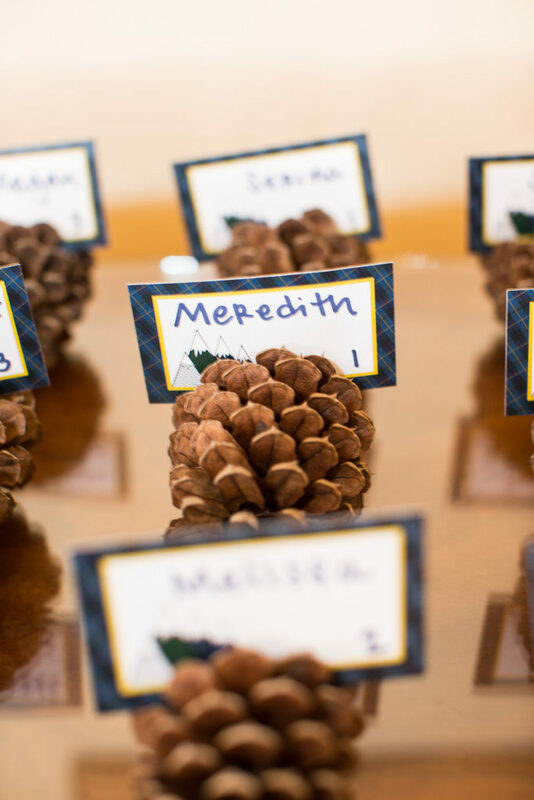 Looking for a inexpensive and readily available place card holder? Pinecones work perfectly and can be spray painted to match your decor! We asked Leslie Hartig Floral Design to create centerpieces filled with winter greens and natural elements to soften the masculine linens from Waterford Event Rentals. 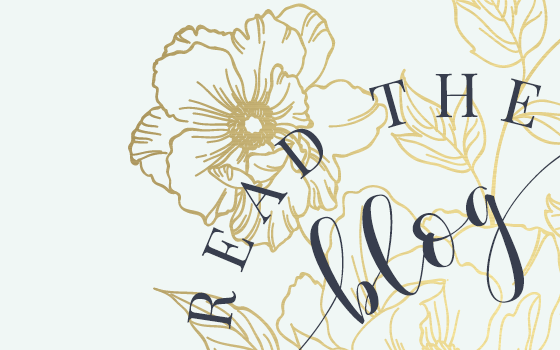 Our goal was to make a beautiful space for Meredith and her guests, but not too feminine. 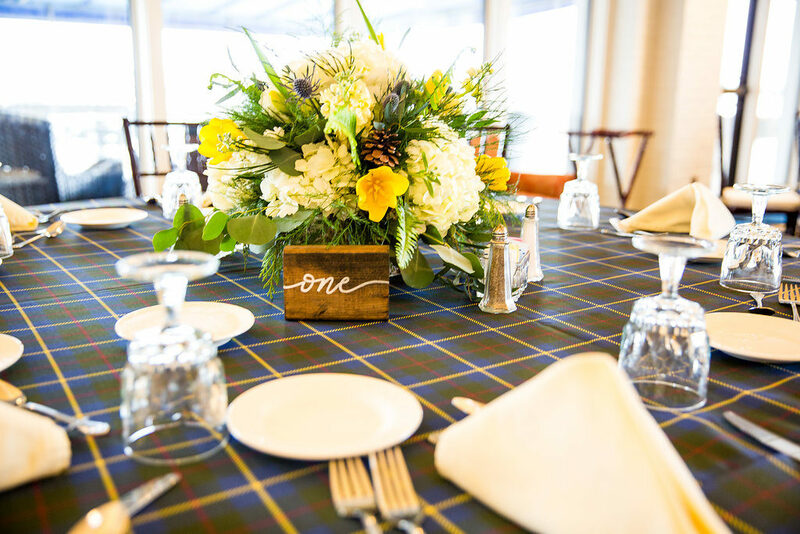 We achieved a perfect balance with masculine plaid linens, wood accents, natural elements and plenty of winter greenery. Pops of yellow, which happened to be mom-to-be’s favorite color, also helped to brighten the room. You can see touches in the florals, linens and dessert station backdrop. The chair at the gift station was an ever so slightly more golden hue. 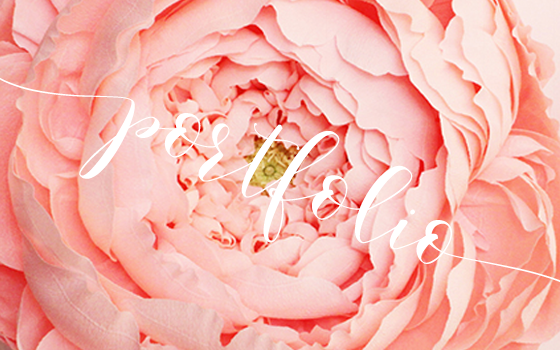 To create a focal point in the room, rental props were brought in from Mad Hatter Vintage. The teepee is our favorite! Treats for the road! 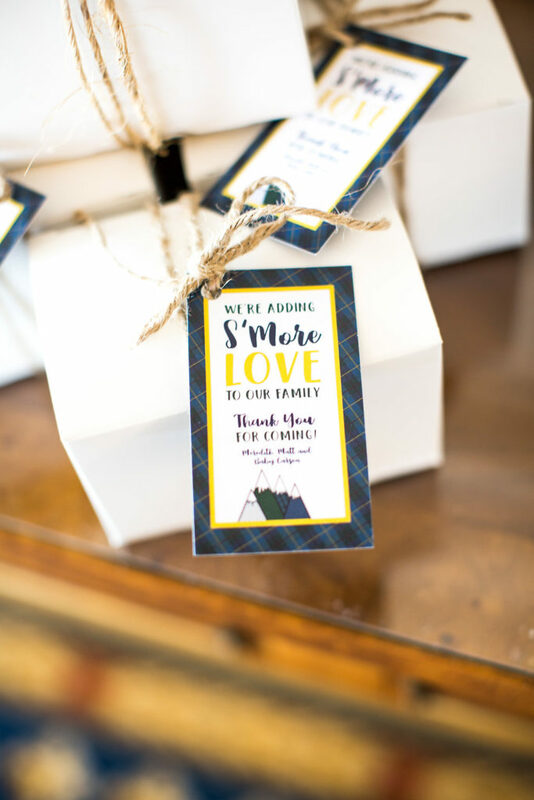 Finishing off s’more kits with twine, instead of ribbon, was the perfect touch for this adventure themed boy baby shower. 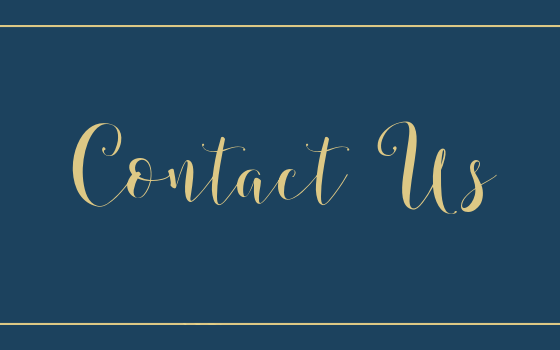 Props: Mad Hatter Vintage & Jollity & Co.